-Memorize some of these verses with your kids, and have them each recite one before Thanksgiving dinner. All of these would be easy for young kids to memorize, and you can add in some of the surrounding verses to give older kids more of a challenge. -Print up these verses on decorative cards to include at each place setting. Have guests read them aloud, or just allow them to take the cards home to use as a bookmark. 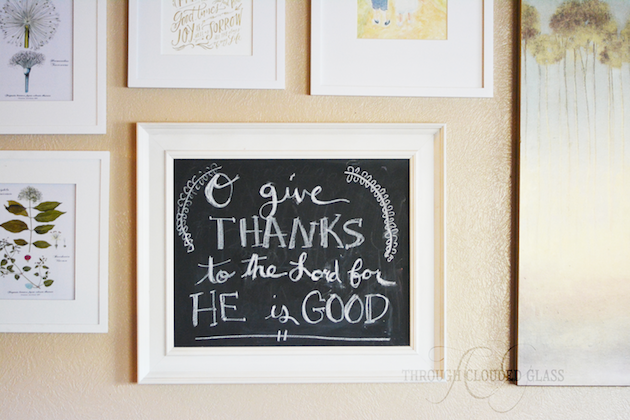 -Write a verse on a chalkboard, or create your own Thanksgiving printable to display!
" Thanks be to God for His indescribable gift!" "We give thanks to You, O God, we give thanks! For Your wondrous works declare that Your name is near." And give thanks at the remembrance of His holy name. [a]"
I will tell of all Your marvelous works." Let us shout joyfully to Him with psalms." "Oh, give thanks to the Lord! Call upon His name; Make known His deeds among the peoples!" I love the idea of teaching Bible verses to my kids that go along with different seasons of the year, and I think these are some good verses to focus on as we enter Thanksgiving and the Christmas season! Our blessings are so apparent at this time of year, and it's wonderful to have reminders to thank God for our blessings. 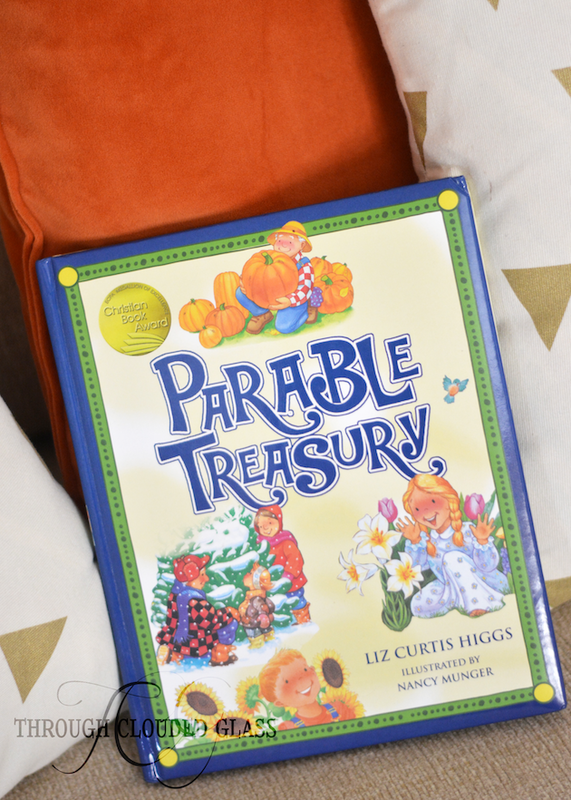 If you are looking for some ways to incorporate Bible verses that go along with different holidays or seasons, Liz Curtis Higgs's parable children's books are a great place to look for inspiration! She has written four children's books that tell stories surrounding different seasons, with valuable lessons hidden in the stories - The Parable of the Lily (Easter/spring), The Sunflower Parable (summer), The Pumpkin Patch Parable (fall), and The Pine Tree Parable (Christmas/winter). The books also include Bible verses throughout the pages that go along with the principles of the stories. I always thought these would be great Bible verses to work on with my kids, so I was excited to get The Parable Treasury, which is a volume that includes all four of the Parable books! My kids have already been pestering me to read it with them, and I am happy to use this as an opportunity to help them hide more of God's word in their hearts over the next months. 1. Go to my Twitter profile. "Great resource to teach kids valuable lessons and Scripture throughout the year! 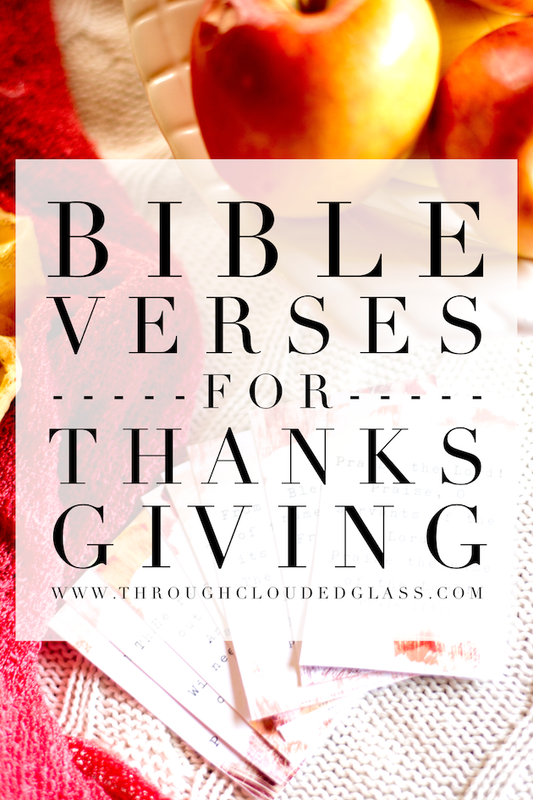 #giveaway http://www.throughcloudedglass.com/2015/11/thanksgiving-bible-verses.html "
That's it! Must be a U.S. resident to enter. I'll pick a random winner on Friday, November 20 and contact the winner via Twitter. If winner does not respond within 48 hours, another winner may be chosen. Prize provided and mailed by Tommy Nelson. What are some ways you incorporate Scripture and giving thanks to God into your Thanksgiving celebration? Note: I received a copy of The Parable Treasury for free from Tommy Nelson in exchange for an honest review. These post is wonderful. Thank you for sharing those verses, and for the book idea to share Bible stories and verses with my kids. Love these! We have the 1 Chronicles verse on our mantle in a pretty fall printable I found on Pinterest and I love it. So cute! Thanks for sharing these! 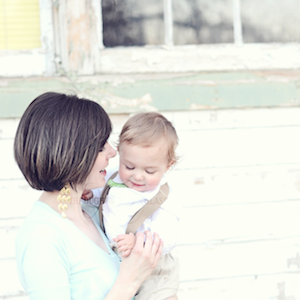 I was rounding up my favorite Thanksgiving verses too! Callie, I LOVE your selection of Thanksgiving verses! And am so grateful you shared my Parable Treasury with your blog readers. Even more, I'm thrilled you are committed to planting God's Word deep in children's hearts. Bless you!